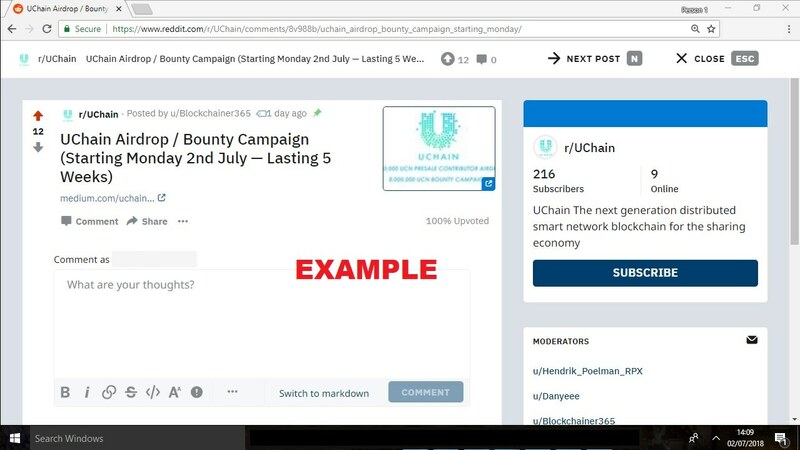 *Bounty pool is fixed as UCHAIN funds already raised. Token distribution estimated 4 weeks from end of bounty. Earn UCN by answering some simple questions and letting us know if you wish to partake in our bounties. Users must follow our Social Medias to partake. Follow our Twitter, Reddit & Medium and earn UCN by liking, retweeting and clapping our articles. Rewards are tiered depending on followers & karma. Users will be able to publish reviews regarding UChain on various platforms in exchange for UCN. These can be blogs, videos or graphics! Users of Bitcointalk will be able to include a Signature to use in their posts around the forum to Earn UCN. Rewards tiered depending on rank. Users who are fluent in a different language will be able to offer their services in translating our Whitepaper and other Marketing Materials. For anyone who is joining our bounty campaign via a friends recommendation, please feel free to make us aware of this and they will be rewarded. We will look to occasionally run ‘Super Bounties’ which will allow our community to earn more UCN for certain tasks within a specific time period. Report Forms open every Friday and close the following Sunday at midnight UTC. Stakes may be deducted or members removed from the campaign for fraud, cheating or ANYTHING we deem to be unethical behaviour. We reserve the right to change the terms of the Bounty at anytime. Bounty manager decisions are final. Reports MUST be made using the forms listed on the g0blin website. New users are approved every 24 hours. Must join UChain Bounty Telegram if registering for social media, signature, creative, translation. Like & Retweet up to 10 UChain Twitter posts a week. Max 2 retweets/tweets a day, spaced at least 1 hour between posts. All retweets/tweets MUST @ tag at least one of the following: Crypto review site, Crypto influencer (Youtuber, Blogger etc), Crypto news site. @ tags should be unique each time. Report your tasks at www.g0blin.com/Uchain each week, between Friday 5pm UTC and Sunday 11.59pm UTC. Bitcointalk users who also post their report in our bounty thread will gain 5 stakes a week bonus. Minimum account age 6 months. We will not update followers. No retweets over 3 days old. Tweets MUST be unique to the project. Tweets must NOT include copy/paste information. Users who make Tweets including investment advice, price speculation, “best project/team” etc will be banned. Reddit bounty involves 2 tasks. Upvoting and sharing. Reposting the same content on a Subreddit within 8 hours of another user will result in you being banned from the campaign. No shares over 3 days old. Posting on Reddit about the bounty program will not be rewarded. Accounts must be over 3 months old. We will not update Karma scores. Extra bounties not listed here may be offered to exceptional performers. Reporting a sharing task without the appropriate comment Karma will result in you being banned from the campaign. Users who make posts including investment advice, price speculation, “best project/team” etc will be banned. Must subscribe to Official UChain Medium account. Clap a blog post on the Official UChain Medium blog 50 times. Maximum 5 times per week. Only clap blogs posted within the last 5 days. Create Steemit posts, Youtube videos, Telegram Stickers, Infographics, Medium posts and more! Work should be unique and not plagiarized. Blog/Videos etc should be posted on social outlets with genuine reach. Low quality work/spam will not be accepted. Add signature and avatar of your account rank. Signature and avatar must be kept until the end of the bounty. Only 2 posts a week allowed in localized threads. Translate UChain, Whitepaper, One Pager, Ann Thread and Bounty thread for rewards. ALL translators must be approved before starting. ANN/Bounty Threads should be updated 5 times a week. Dead/Inactive threads will NOT be rewarded. Automated and low quality translations will not be accepted. We will occasionally run “Super Bounties” which offer BIG rewards for certain tasks that fall outside of the regular bounty. Usually these must be completed in a specific time period. ALL Super Bounties have their own report form which will be linked in the pinned post. Only available for UChain bounty members.